Revive the Evil Goddess with this wallscroll featuring gorgeous illustrated artwork in Yoshitaka Amano's signature style! Find out about the world of Fencers, Furies, and fairies with this 56 page, full color hardcover art book. It's packed with character profiles, illustrations of fairies, backgrounds, and event scenes! Size: Width 6.1" x High 8"
Fairize your shelf with this sturdy, matte-finish slipcase Collector's Box! Dimensions: Width 6.2" x Height 8.4" x Depth 1.4"
Flip the cover sleeve to unveil the original Japanese Limited Edition art by Yoshitaka Amano! ©2016 IDEA FACTORY / COMPILE HEART All rights reserved. Fairy Fencer F is a trademark of IDEA FACTORY. 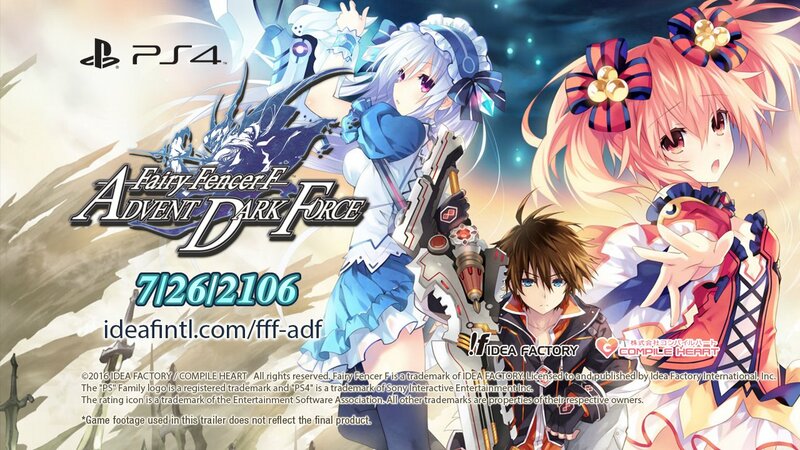 Licensed to and published by Idea Factory International, Inc.
Click the button below to add the Fairy Fencer F: Advent Dark Force Limited Edition to your wish list.